Catchy title. But not exactly accurate. 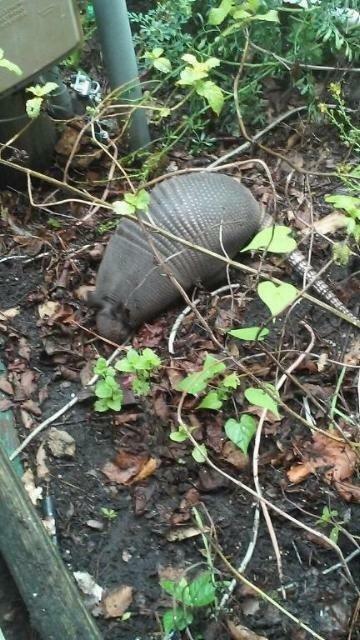 Let’s see if I can get from an armadillo to ice in just a few steps. 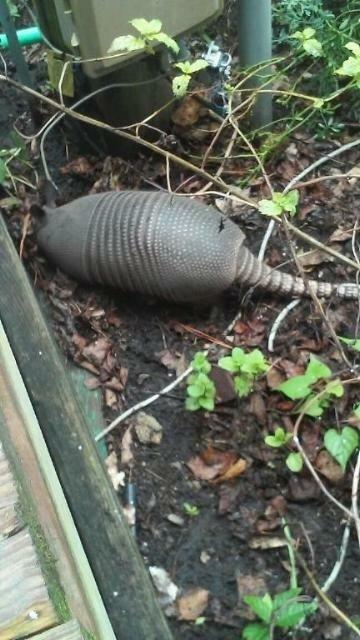 The other day my dog saw his first armadillo. He looked at me for clues – Do I chase it? Play with it? Kill it? Eat it? Yep, what we now have in my small neighborhood is, as Yosemite Sam would say…”Rachin’ Frackin’ Varmint Rabbits”!!! They are everywhere. Looks like a low-budget Alfred Hitchcock movie set and I sure ain’t a Tipi Hedren look-alike. Woke up early this morning…way too early for my old body…a neighbor needed a ride to the local Veterans’ Administration Clinic as he had to catch the VA van heading over to South Carolina this morning for some long overdue tests. Just my luck at 6 in the morning my dog decides to take off like a bat on speed chasing two rabbits. [Note; Yes, I always put a harness and leash on my dog; unfortunately somewhere between the word ‘harness’ and the word ‘leash’ my dog took off running. This is NOT his usual behavior.] I had only 30 available minutes in which to panic, cry, walk as fast as I could around the entire neighborhood (four times) and clap my hands, whistle, and call my dogs name loudly and repeatedly to make sure all my neighbors could enjoy the early day as much as I did. My antics set all the neighborhood dogs to barking. Oh joy, I felt like a mother Penguin when among all the barking dogs I was able to identify the bark of my own little dog. Using stealth and cunning I walked between two houses following the sound of his barking voice, I got on my hands and knees in the mud to crawl through someones garden and under their cucumber vines (oh, very healthy looking vines you got there mister) and around to the back of their tool shed. Ah, there was my dog Jack, baying his head off like he had treed a raccoon. 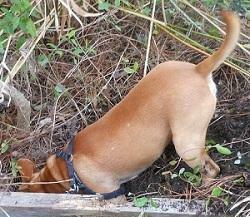 He was alternately barking and digging, still trying to reach the rabbit that had hidden under the shed. I lifted and carried Jack, as I crawled out from the cucumber vines, and was able to get him safely home arriving at my house at 6:26 in the morning, dead tired and covered in mud. Whew, with four minutes to spare! I cannot be late to drive my neighbor to the VA and I cannot get angry with my dog because he is part Beagle – I mean, chasing rabbits is what they do, right? Don’t worry; no rabbits were harmed. At 6:30 in the a.m. I give the neighbor a ride to the VA; ten minutes later I arrive home and check my emails, give another friend a ride to work (did I mention that I run the local free taxi service?). Finally I go to my daughter’s house to pick up my grand-dog. As a dutiful dog-sitter, I always check for a note in case I need to give her an allergy pill, or give her an extra poop walk. “Mom, in your spare time, since you are retired and have time to drive strangers all over for free, and while walking your own dog and baby-sitting my dog, can you please transfer all the food from the dead fridge to the working fridge in my other house half way across town…since you like to drive the car so much”. Aha! First I think, maybe I should have started my day with coffee. But I am smarter than that. I went to Lowe’s where the coffee is free but, on this particular day, the customer service was lousy. They may be able to match prices but they cannot always match customer service. So I went to another store with free coffee. Home Depot – which has most excellent employees; maybe they are happy because they get to write their name using Sharpie markers on their snappy orange vests. I was shopping for a brand new smallish fridge. It had to be in my price range, light enough for me to carry up four steps while dodging spiky cactus and delicate succulents into my daughter’s house. Did you know there is a rule that says if you lay a fridge on its side you cannot plug it in until it has been in the upright position for at least 24 hours. Who writes this stuff – airline hostesses? So the fridge also had to be small enough to stand upright in the mouth of the car trunk. Yep. I bought a cute little stainless steel beauty of a fridge. It’s a beauty. Then I transferred the food from dead fridge to new fridge. Oh, sorry, this might be helpful. Some of you may use the word ‘frig’ and some may use ‘fridge’ – http://www.grammarphobia.com/b… Okay, back to my story. Bad news is that when the old refrigerator, fridge or frig died the strawberries and raspberries didn’t survive the temperature fluctuations in the freezer compartment. Some corn on the cob looked a little iffy, too. Good news is that the Luigi’s lemon ice was just fine. In fact, it was delicious! In the Spring my neighbor started a small garden. Lately it seems that ‘something’ has been eating all her plants and digging up the soil. I do not have the heart to tell her that it is most likely the rabbits eating the plants and the armadillo doing clean-up eating the worms and grubs. My friend managed to snap a couple of photos using her phone (did I mention that my friend is smart and has a Smart Phone). She sent the pics to my phone somewhere around half past midnight. Truth is, there is a slight lag in time needed here. It was necessary for me to take my phone to the T-Mobile store and ask the helpful clerk to please, please, please (in my younger days I might have batted my eye lashes, but I guess being an old lady is enough to encourage the young men to offer assistance) would he kindly push the correct buttons on my phone to send the pics to my email. Yes, I admit that am not smart enough to own a Smart Phone. 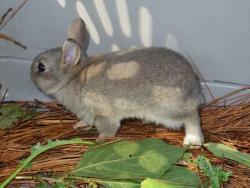 Here is one of the cute little adorable bunnies at midnight. Eeeek! There were 17 more plus another batch of babies, but this was the only one who sat still long enough for his close up. 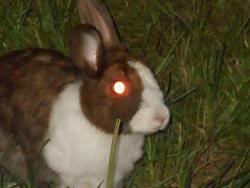 The rabbits are spreading. They are now in my yard and gardens. This could get ugly. Or maybe I should just plant some carrots. Twenty four hours later the mint, garlic chives, Thai basil and several young Sassafras have been chewed down to almost nothing. These adorable little bunnies like to dig random holes for me to trip over. Walking my dog is now like upper-body strength training. There was a litter of bunnies in one neighbor’s yard. 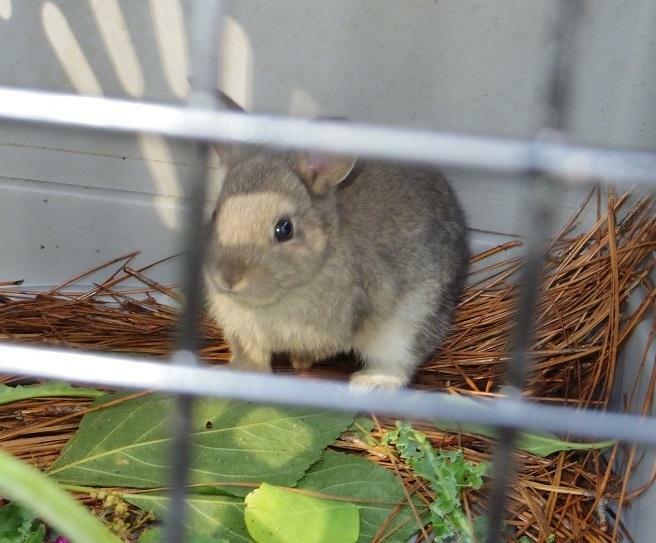 Now that the little rabbits are weaned and eating on their own, one of them is living (temporarily) in a cage-within-a-chicken-coop in my yard waiting to be re-homed. My hope is that every one of these (insert Elmer Fudd type expletive here) wascals er, rascals can find a new home – and far away from my garden, please. 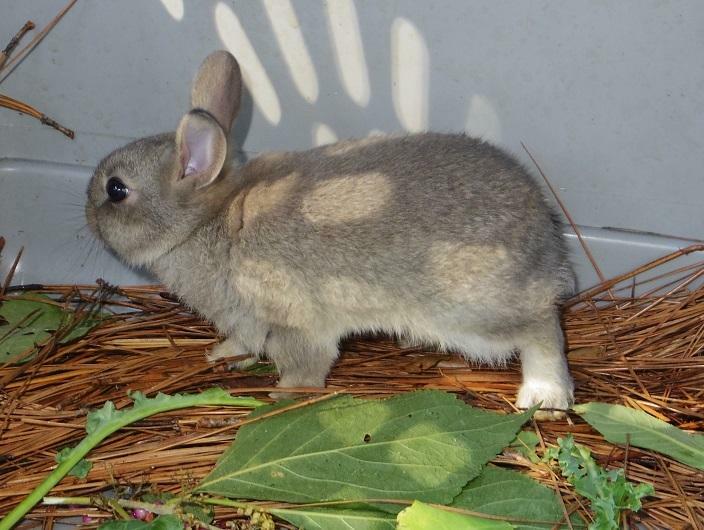 Update on the feral rabbit situation. 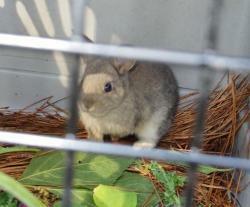 We still have the feral rabbit problem. I made a fence for my daughter’s small kitchen garden. 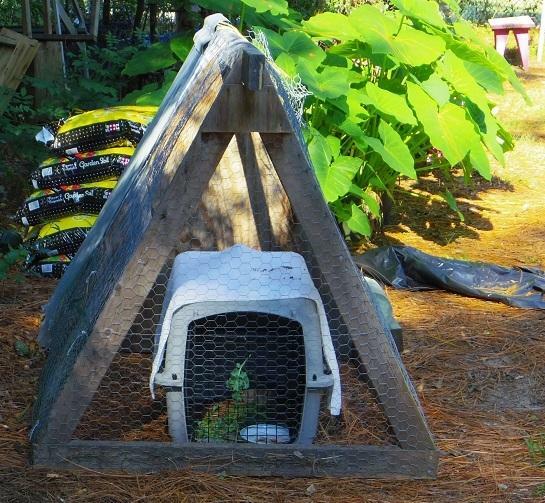 Today my friend PlantSister sent me a bit of information; a link with lots of natural rabbit repellents. I will try some of these methods…. My daughter’s little garden is producing. The fence has kept out the nasty feral rabbits. 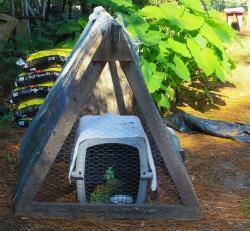 Sometimes the dog gets to enter the little garden fence and help weed and harvest. So tranquil; so peaceful. Yikes!! 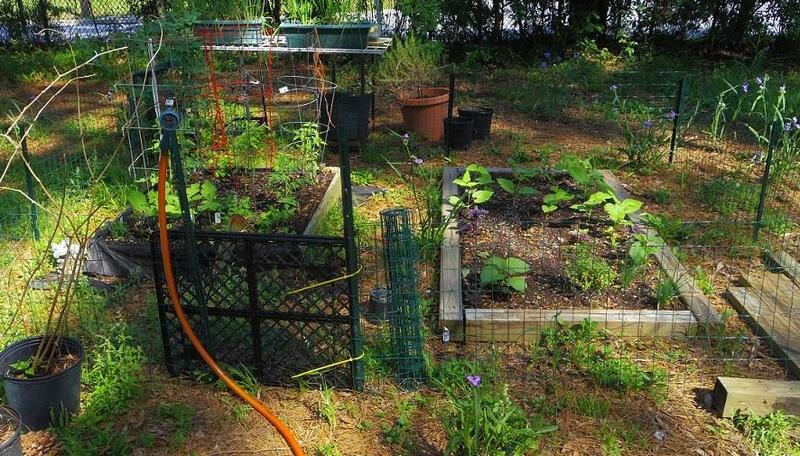 The dog suddenly lunges under the bean plants, through the tomato cages, what the ??? The little gray rabbit that had been hiding under the leaves of the bean plant was spotted by the dog and all heck broke loose. We have no idea how the rabbit entered the securely fenced garden but it leaped over the fence and escaped. That was a few of days ago; the dog continues to look under the bean leaves, under the tomato leaves, under the cucumber leaves…she knows there is a rabbit in that garden somewhere!